It was one of those days when I decided the overloaded bookcase was due for some cleaning. At times, this letting go of books thing is easy and at others, it’s like trying to cast off a friend. This particular day, after I scanned the fiction shelves and didn’t find anything discard worthy, I started on the nonfiction shelves. I soon found some books that definitely could go. I removed an old college text, an unused cookbook, a book about golf, a book on Stalingrad, and then my hand hit on a book that had no title on the spine, only blue binding tape. There’s another one that can go, I thought. When I removed it from the shelf, I found it was hand bound with a soiled gray tagboard cover. 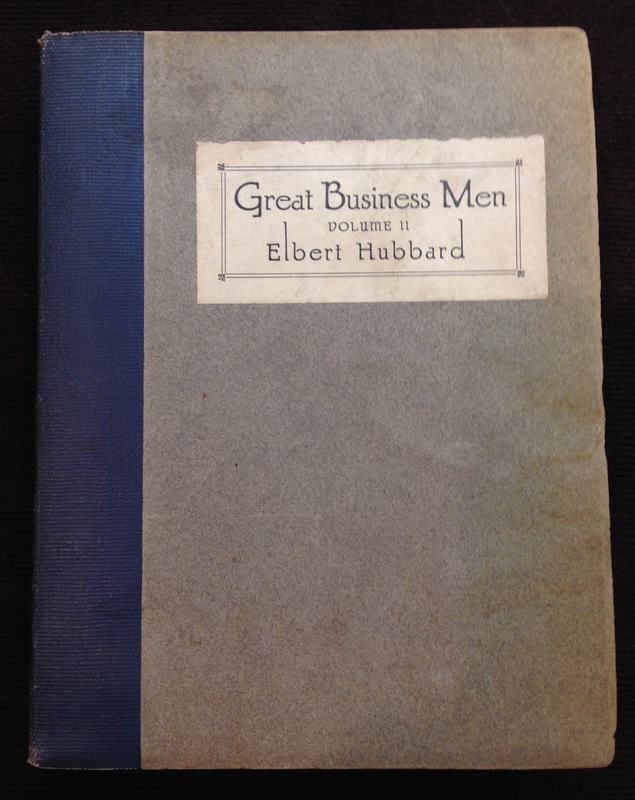 On the cover was a rectangular sticker with the title Great Business Men, Volume II by Elbert Hubbard. What the heck was this? Obviously, I had to take a look inside. 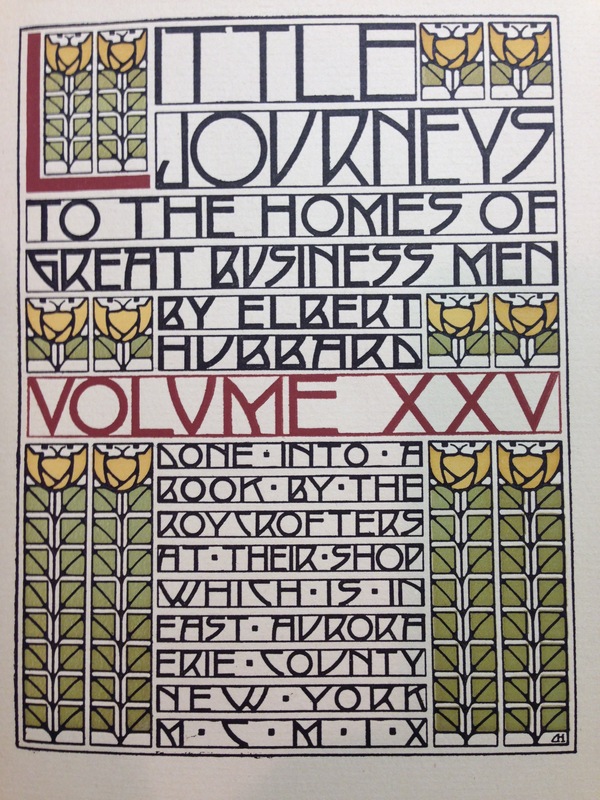 The title page had a distinctive look, the motifs reminding me of Frank Lloyd Wright. The book, copyrighted in 1909, was written by Elbert Hubbard. 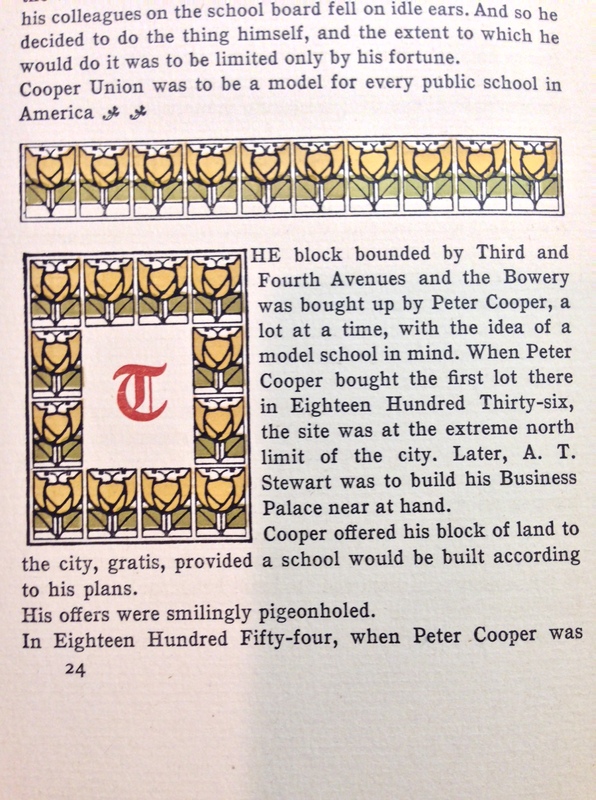 Listed in the index were these great businessmen: Peter Cooper, Andrew Carnegie, George Peabody, A. T. Stewart, H. H. Rogers, and James J. Hill. The only great businessman I recognized was Andrew Carnegie. But, the name of the town was familiar. East Aurora. At one time my parents owned some acreage there. To help maintain the property, my dad bought a vintage tractor and mower. I remember driving that behemoth, mowing the flat meadow that bordered the road. I also remember the day my father cut a garter snake in half with a shovel in that same meadow. The image has never left me. Wish it would. Running through the property was a creek, the bed covered in rocks of all sizes. One day from the woods, I spotted two men in the creek bed loading stones into a wheelbarrow. I watched until one said to the other, “Let’s go get lunch.” As soon as they were out of sight, I ran from the trees and managed to tip the wheelbarrow on its side. Then I ran to tell my father. He had a thing about trespassing and stealing. The Arts and Crafts look of the book couldn’t be missed. So I did some research. 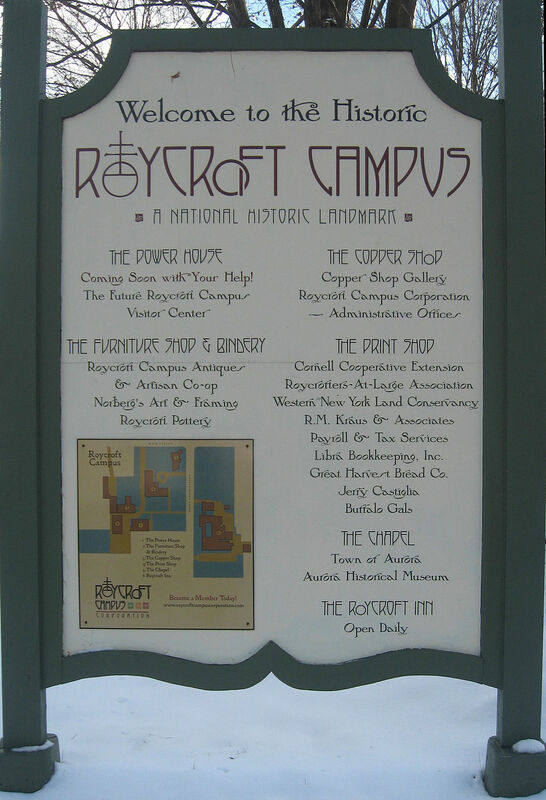 East Aurora was and is the home of The Roycrofters, an Arts and Crafts Community founded in 1895 by Elbert Hubbard. They crafted books on handmade paper in their bindery, furniture in their workshop, and leather and hammered copper pieces in their studios. They became a leading producer of Mission style products. The name is based on Samuel and Thomas Roycroft who crafted books in London from 1650 to 1690. The Arts and Crafts movement developed as a reaction against the industrial and mechanized Victorian Age, wanting to renew pride in simplicity, craftsmanship and design. It was in its heyday in the USA from about 1900 to 1916. I own one piece of Mission furniture. An umbrella/cane holder. I found it in a thrift store in Kansas City. Elbert Hubbard was born in 1856 in Bloomington, Illinois, and died on board the Lusitania when it was torpedoed by the Germans off the coast of Ireland in 1915. For a time he worked for the Larkin Soap Company based in my hometown of Buffalo. Hubbard pioneered the use of premiums and “leave on trial” marketing. At some point he became involved in the Arts and Crafts Movement. In addition to founding The Roycrofters, he wrote a piece I’d heard of called “A Message to Garcia.” A colorful character, Hubbard is attributed this quote: Never explain – your friends do not need it and your enemies will not believe you anyway. Today tourists and Arts and Crafts Movement aficionados can tour the Roycrofters’ campus. Sadly, as a kid, I was so close, but never saw it. As you can see, after I took the book with the unmarked spine and gray tagboard cover into my hands and discovered what it was, I did a little research, a little reading. Before I knew it, there went a few hours and another day of “cleaning” the bookcase. Does this scenario resonate? But I’m glad I took the time to investigate and didn’t just heave an old book into the donation bag. At some point, I realized it had belonged to my father, one quickly taken from a dusty box of books and slipped into our bookcase after his death. This entry was posted in Authors, Books, Creativity, Inspiration, Looking for Inspiration, Reading, Writing and tagged A Message to Garcia, Andrew Carnegie, Arts and Crafts, Arts and Crafts Movement, East Aurora, Elbert Hubbard, Great Business Men by Elbert Hubbard, hand-bound books, Lusitania, Mission style, Roycroft Campus, Roycrofters. Bookmark the permalink. makes me want to stop what I’m doing and do more research. I’m glad you enjoyed the post. Happy writing to you! P.S. I giggled at your interesting typo! Easily removed. What a treasure! Both the book and your writing! Always happy you stop by. And keep me inspired! Snake cut in half, rock thieves, and handmade books all made for an interesting read. I really liked this. Hi Susan – Glad you enjoyed. As I read your first sentence, I realized the post was quite an odd juxtaposition of things. Thanks for stopping by.